This is Part 1 of a two-part series. Read Part 2 here. But he knows Puerto Ricans ultimately don’t have the power to decide their future – it lies in the hands of the U.S. government. 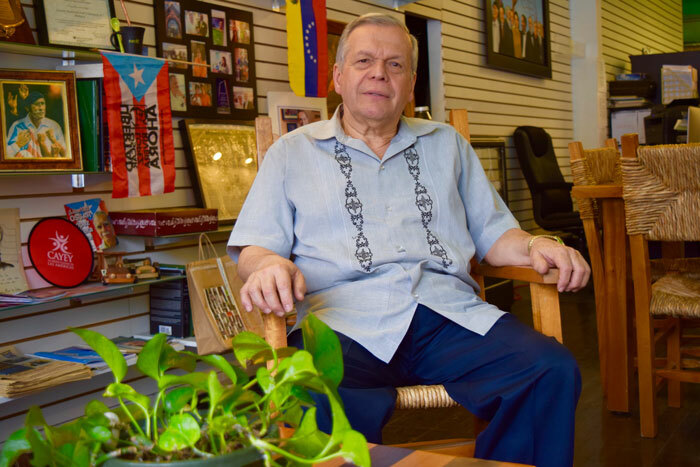 López runs the Puerto Rican Cultural Center (PRCC), an institution in the Humboldt Park neighborhood of Chicago. López established the PRCC in 1973 with his brother, well-known Puerto Rican nationalist Oscar López-Rivera. 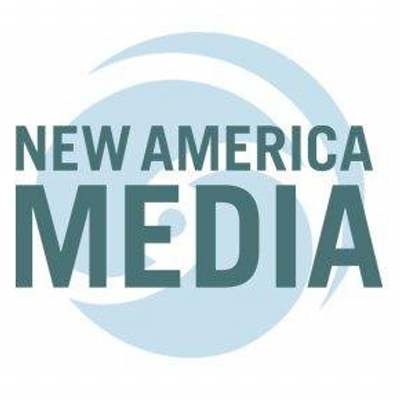 López-Rivera is currently serving a 55-year sentence for seditious conspiracy, similar to charges faced by South Africa’s Nelson Mandela in his fight against apartheid. The issue of Puerto Rico’s status is top of mind for Chicago’s Puerto Rican politicians, who don’t always agree on whether the island should become a U.S. state or an independent country. “Free Puerto Rico so she can solve the problem of her crushing debt without being handcuffed by Congress, its distant and inattentive colonial master,” Rep. Luis Gutiérrez (D-Ill.) said in a Feb. 11 speech to the House of Representatives calling for Puerto Rico’s independence and action to alleviate the island’s $72 billion debt crisis. The expansive, wood-paneled House chamber is a pivotal place for the island of Puerto Rico. It is a room where many of the political decisions affecting Puerto Ricans are made. It is a room where Puerto Ricans have no vote and are not represented save for one non-voting resident commissioner. It is also in this room that Congress passed the Jones Act of 1920, which resulted in heavily taxed imports that make the cost of living unbearably high for many residents there. It’s where Congress passed the 1950 Puerto Rico Federal Relations law that eventually established the island’s status as a “free associated state” — belonging to but not part of the United States. It’s where some members of Congress may soon form a “financial control board” to review the island’s finances. Gutiérrez knows the Puerto Rican voting bloc in the U.S. has the potential to turn the island’s debt crisis into a topic of national conversation during the 2016 presidential election. He and other elected officials, including State Sen. Iris Martinez (D-20th), 30th ward Ald. Ariel Reboyras and 35th ward Ald. Carlos Ramirez-Rosa, met recently to discuss political mobilization. The leaders are pressuring House Speaker Paul Ryan (R-Wisc.) to make good on his promise to push along legislation by the end of March that addresses Puerto Rico’s debt challenges. The proposed legislation has been stalled while those in Congress deliberate on how to address the debt – will they allow Puerto Rico bankruptcy protections? Will they offer federal aid? The clock is ticking. Puerto Rico has already defaulted on $174 million in debt payments, with officials on the island warning they will soon run out of money to pay expectant bondholders, a majority of whom are from the United States. 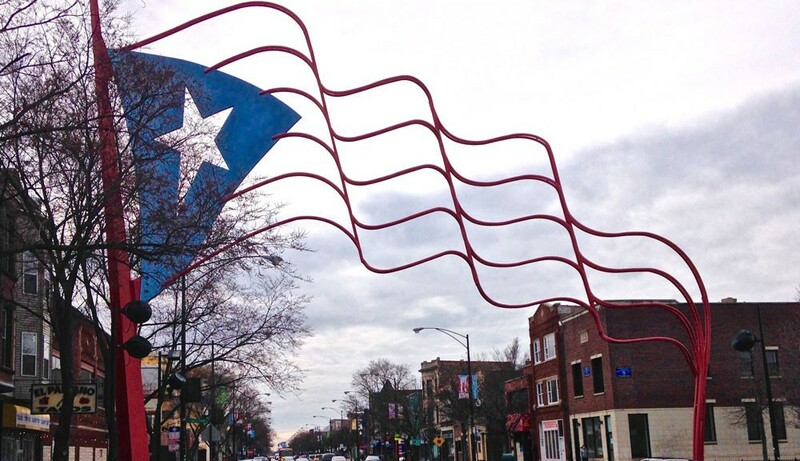 In Chicago, much of the Puerto Rican diaspora is concentrated in Humboldt Park. The community’s centerpiece is its Paseo Boricua, “Puerto Rican Promenade,” a stretch of Division Street between California and Western Avenues, demarcated by giant red-and-blue-painted steel Puerto Rican flags. The flags were erected in 1995 in honor of the 1.5 million Puerto Ricans who came to the mainland between 1946 and 1966, many of whom worked in the steel industry. For cultural leaders here, the question of Puerto Rico’s political status has implications that range beyond the economic. 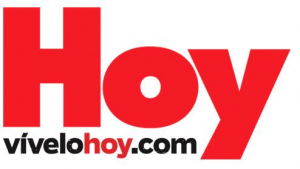 López, for example, is thinking bigger than the political categories of statehood versus independence. He wants autonomy for the island, and he also wants North America to display the same border flexibility for migration that it does for trade. He envisions a European Union-like confederacy for the Americas whereby all Latin Americans are afforded the right to move across borders without reprisal. 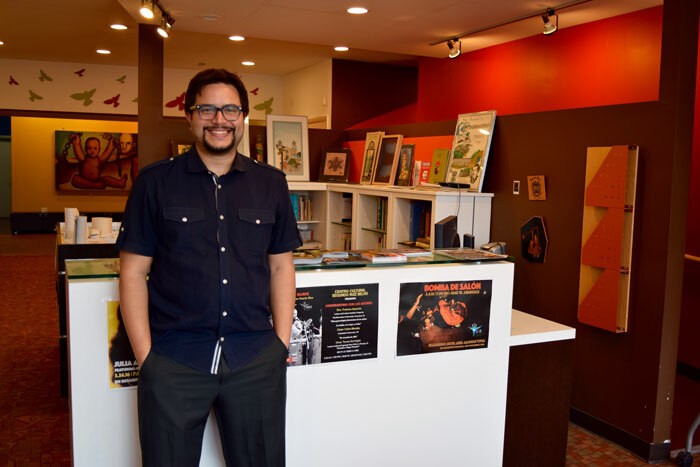 In the Hermosa neighborhood northwest of López’s PRCC office sits another stronghold of Chicago’s Puerto Rican diaspora: the Segundo Ruiz Belvis Cultural Center. 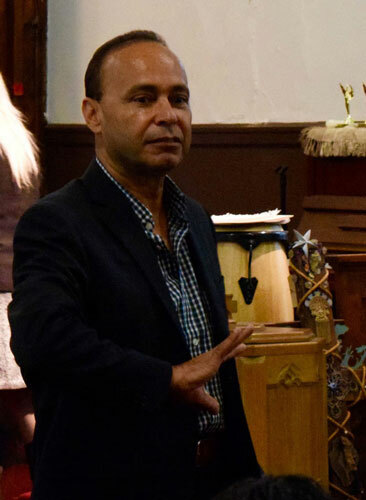 Director Omar Torres-Kortright, 38, came to Chicago after graduating from the University of Puerto Rico with degrees in Hispanic studies and art history. Torres says he saw his transition to the mainland as an act of immigration, not migration. Independence makes most sense to Torres-Kortright because it means severing colonial ties with the United States, which would eliminate the cycle of exploitation. He says a lot of his friends are surprised he isn’t pro-statehood, especially given the fact the independence movement is in the political minority on the island. “I honestly think that statehood is a dream for many people, but it can never pass Congress, and the United States political system will never allow it,” Torres-Kortright says. 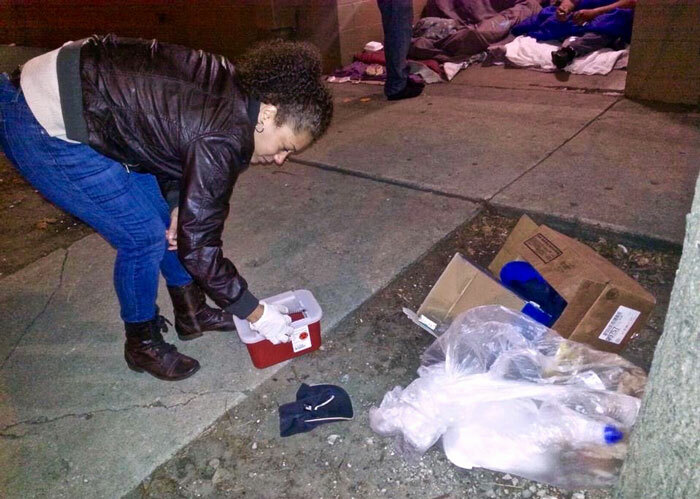 Melissa Hernandez can be seen most nights handing out food and clean needles to homeless drug addicts in the streets of Humboldt Park, Little Village and Back of the Yards, popular settlement spots for Puerto Ricans in Chicago. A majority of the people she helps are from the United States, but some come from the island, which is slashing funding for healthcare and rehabilitation services. A former drug addict who now works as a dental assistant, Hernandez founded the Puerto RICO Project, an NGO that offers harm-reduction services to homeless Chicagoans struggling with drug addiction. Hernandez regularly updates the Puerto RICO Project’s Facebook page with vivid accounts of her nights on the streets and her own emotional struggles, calling for more help for those struggling with drug addiction and poverty here and in Puerto Rico. Hernandez is Puerto Rican, but she was born and raised in Chicago and grew up in poverty. She suffered sexual abuse as a child, became an addict in her adolescence and survived human trafficking. Her political opinions waffle between statehood and independence; she says it’s hard for her to align herself to any political system. “If P.R. becomes independent, I know that people will lose their Social Security benefits, law enforcement support, federal aid,” Hernandez says. She worries if the meager support the U.S government provides were to suddenly disappear, Puerto Ricans wouldn’t be prepared.